AUTOMATIC BLISTER CARTONING MACHINE IT』S SUITABLE PACKING PROCESSING ,BLISTER, OTHER RELATED SIMILAR PRODUCT CONTENT WITH COMPACT AUTO LEAFLET FOLDER,BOX LOADING,BATCH CODE EMBOSSING AND AUTO SEALING(OPTIONAL HOT GLUE SEALING).IT ADAPT PLC CONTROL,PHOTOELECTRICITY SUPERVISING TO COORDINATE WITH EVERY PART. AUTOMATIC STOP AND TROBLE DISPLAYING WHEN MACHINE RUNNING IN ORDER TO SOLVE TROUBLES IN TIME . REJECTION AUTOMATICALLY,IF NO PRODUCT,NONSTANDARD HEIGHT OR LACK OF LEAFLET. STOP AUTOMATICALLY,IF INCORRECT POSITION OF PRODUCT,INTO CARTON. 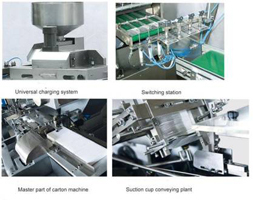 STOP AUTOMATICALLY,IF NO CARTON,OR OUT OF LEAFLETS CONTINUOUSLY. 6. PLC AND TOUCH SCREEN AUTOMATICALLY DISPLAYING DEVICE FOR SPEED AND FINISHED PRODUCT COUNTING RBAC-100 .